The knee is the largest weightbearing joint in your body. 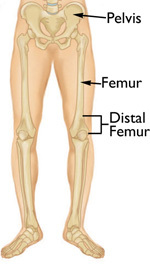 The distal femur makes up the top part of your knee joint. The upper part of the shinbone (tibia) supports the bottom part of your knee joint. The ends of the femur are covered in a smooth, slippery substance called articular cartilage. This cartilage protects and cushions the bone when you bend and straighten your knee. > X-rays. The most common way to evaluate a fracture is with x-rays, which provide clear images of bone. X-rays can show whether a bone is intact or broken. They can also show the type of fracture and where it is located within the femur. To make sure no other breaks are missed, your hip and ankle joints will also be x-rayed. > Computed tomography (CT) scan. A CT scan shows a cross-sectional image of your limb. It can provide your doctor with valuable information about the severity of the fracture. This scan can show whether the fracture enters the joint surface and, if so, how many pieces of bone there are. A CT scan will help your doctor decide how to fix the break. > Other tests. Your doctor may order other tests that do not involve the broken leg to make sure no other body parts are injured (head, chest, belly, pelvis, spine, arms, and other leg). Sometimes, other studies are done to check the blood supply to your leg. > Intramedullary nailing. During this procedure, a specially designed metal rod is inserted into the marrow canal of the femur. The rod passes across the fracture to keep it in position. > Plates and screws. During this operation, the bone fragments are first repositioned (reduced) into their normal alignment. They are held together with special screws and metal plates attached to the outer surface of the bone. To avoid problems, it is very important to follow your doctor’s instructions for putting weight on your injured leg. > Is my ability to walk and care for myself improving? > Are my normal activities of daily living improving? > Is my pain gone or less, and are my knee motion, stability and strength improving? In some cases, bone healing can be slow or not happen at all. If a follow-up x-ray shows rods, plates, and screws breaking or pulling out of the bone, it may be a sign that the bone is not healing. This can happen even if your fracture has been fixed well and you have followed your doctor’s guidelines. > How severe your injury is. Higher energy fractures may be in more pieces and slower to heal, especially if they are open with more damage to soft tissues. > Your bone quality. Better quality bone (younger patients) may keep the plates, screws, and rods better in place. Older patients and those with osteoporosis are at high risk for the implants loosening and pulling out of the bone. Newer techniques and implants may help prevent this risk, but cannot eliminate it entirely. > Your commitment to your recovery. Although recovery is a slow process, your commitment to physical therapy and following your doctor’s guidelines are an essential part to returning to the activities you enjoy. > Do I have any specific risks for not doing well? > Do I have weak bones? > Will I have a brace? > What are my specific risks for surgery? > What will I get to prevent blood clots from forming in my leg? > Will I need a blood transfusion? > Will bone graft be necessary? If so where will it come from? > How much work will I miss? > When can I start bending my knee? > When will I be able to put weight on my leg? > Will I get arthritis?